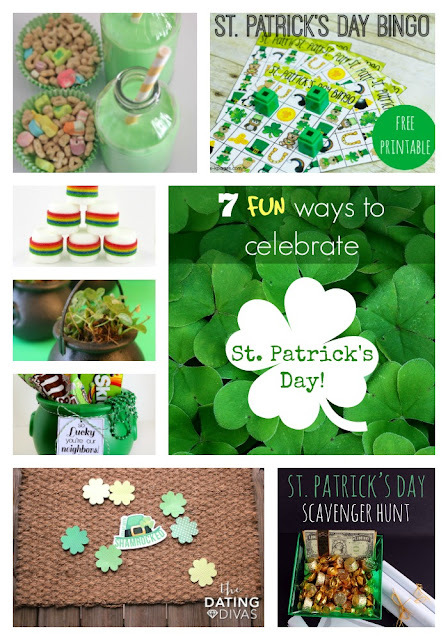 While I'm Waiting...: 7 FUN ways to celebrate St. Patrick's Day! 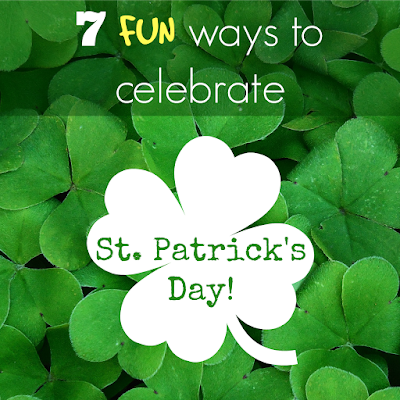 7 FUN ways to celebrate St. Patrick's Day! 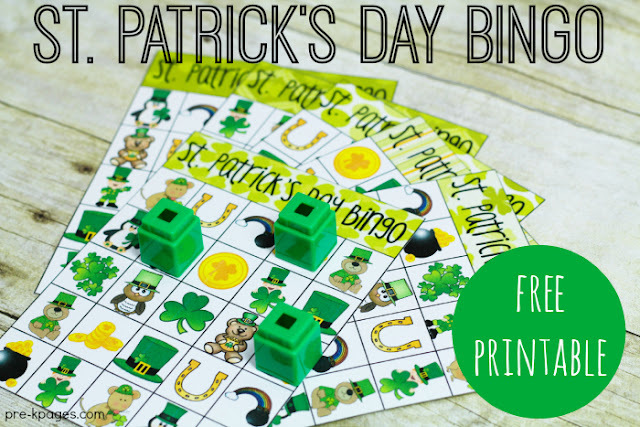 With St. Patrick's Day less than three weeks away, I wanted to share a few ideas to help you get ready for a day of FUN! Shamrocks, the color green, and rainbows? Oh, you know, just a few of my FAVORITE things! :) Here are 7 FUN ways to celebrate St. Patrick's Day! Start the day with a Lucky Breakfast! A few games of bingo is always a FAVORITE at our house! 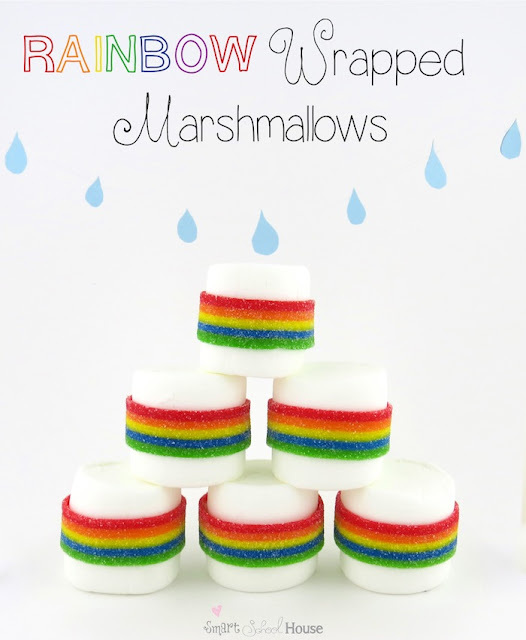 Rainbow wrapped marshmallows? Yes, please! 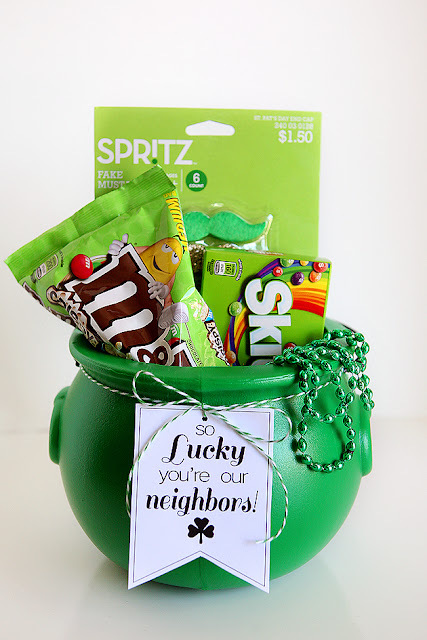 St. Patrick's Day is the perfect day to show your neighbor how lucky you feel that they live next door! 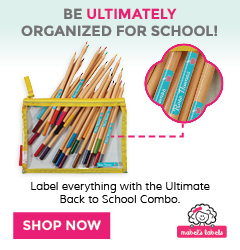 These cute tags will help you deliver just the perfect little gift! This is definitely my FAVORITE! Scavenger hunt. Need I say more?! I know for a fact that this would be our kiddos' #1! What about SHAM-ROCKing someone? 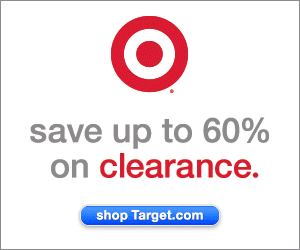 Get your kids involved and chose another family to secretly surprise! This would definitely be a fun tradition to start as a family! Feeling lucky? Which one is your FAVORITE? I'm glad I've got a few weeks to get my ideas together! Cute ideas Holly. I love the idea of Sham-rocking someone! 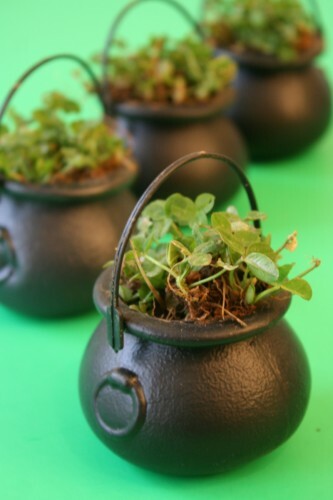 The clover cauldrons are so cute!!! Love those! I used to regularly Irish dance, so St. Patrick's Day was our BIG day each year-it usually involved being in a parade, going to a couple of nursing homes, and one year we even danced outside of a museum downtown! In the years since I stopped attending that dance school, I haven't done quite as much on St. Patrick's Day, but I always make sure to bake some Irish Soda bread to eat with butter and jam :) Yum! Oh my goodness! I bet that was so much fun!!! Thanks so much for stopping by! I hope you have a fabulous weekend! Oh I could really go for one of those rainbow wrapped marshmallows! I stopped over from the link up! You're blog is so cute. Hope you can stop by mine as well! Thanks so much! I thought the rainbow wrapped marshmallows were awesome! I know my kids would LOVE them! Thank you so much for stopping by from the link-up! Hope to see you around again soon! Have a super week! Such cute ideas. I LOVE St. Patrick's Day. Every year we march in the parade and hangout in our downtown. I love the cute lucky charms breakfast. How fun!!! I wish we had a parade close by! Thanks so much for stopping by! Hope you have a super week! I love starting the day with a lucky breakfast! It really is the perfect way to start St. Patrick's Day - or any day for that matter! ;) Thanks so much for stopping by! Hope your week is fantastic! 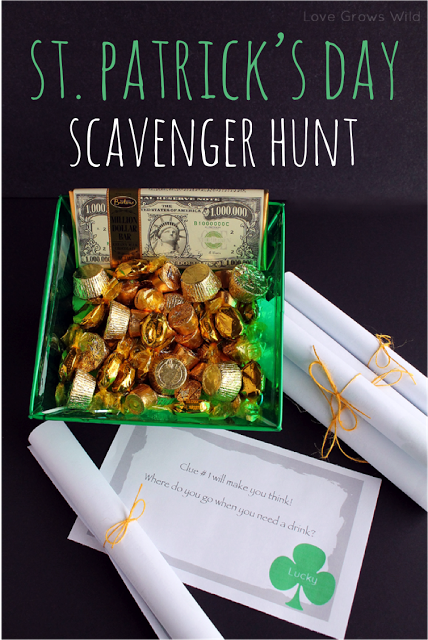 I love the idea of doing a scavenger hunt! 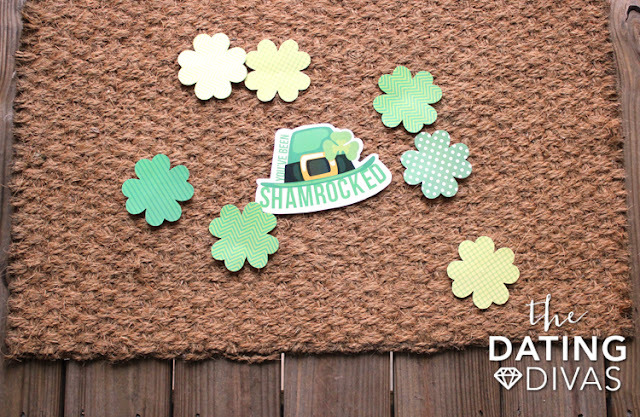 What a fun way to celebrate St. Patrick's Day! I hope you have a fantastic week! Thanks for stopping by! We usually make a special breakfast, snack and dinner, read fun St Patrick's Day books, and paint rainbows. What a fun, fun day! I know your family must love that! Thanks so much for sharing! Definitely a favorite of mine too! These are such cute ideas! 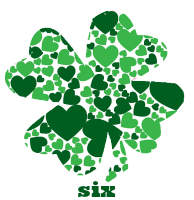 I usually do not do anything for St. Pattie's day. I've been thinking lately that I would try to make a bigger deal out of holidays in our homeschool. I think the kids need that. Thanks for the ideas! I know mine love it just because it's unexpected and a little out of the ordinary. I love holidays like Valentine's Day and St. Patrick's Day to get to do a little extra something for them. 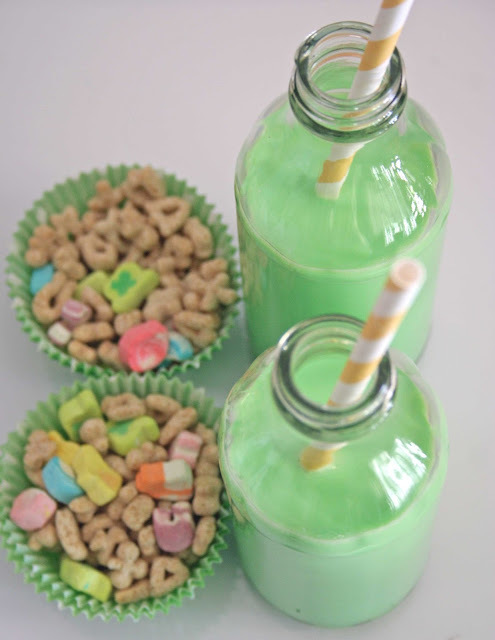 I bet your kiddos would get a kick out of green milk or some Lucky Charms for breakfast! Thanks so much for stopping by! Hope to see you back soon! Thanks so much! I saw them and couldn't resist sharing! Awesome! Thank you so much for letting me know, Lisa! Have a super day!